The Rio Grande begins above Creede and flows through the San Luis Valley, and the stretch between South Fork and Del Norte offers some of the best fly-fishing in the state. Anglers from all over the West will tell you that the Rio Grande is one of the best fly-fishing streams anywhere. Plan your trip to the South Fork to Del Norte section to see why. The fishing here is terrific and the fish aren’t picky, but access is somewhat tricky. You can fish in the shoulder seasons, but summer is the best time to visit. With a watershed of more than 180,000 square miles, the Rio Grande is one of the most vital rivers in the American West. Its headwaters are in the alpine terrain above history-rich Creede, Colorado, and it flows nearly 1,900 miles into the Gulf of Mexico. 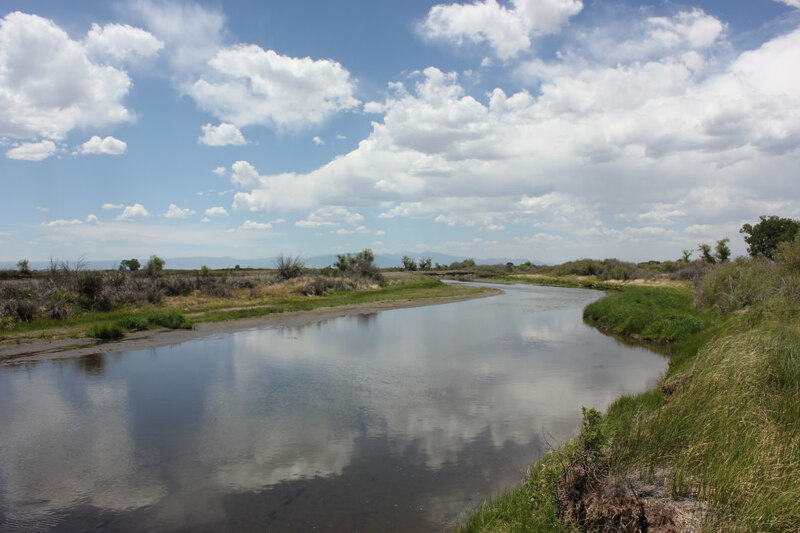 Of all those miles, though, some of the best fishing is in the heart of the San Luis Valley, where the South Fork (near Del Norte) joins the primary Rio Grande and boasts phenomenal trout waters. This area is home to the longest stretch of Gold Medal Waters a designation by the Colorado Wildlife Commision indicating the best spots to fish. 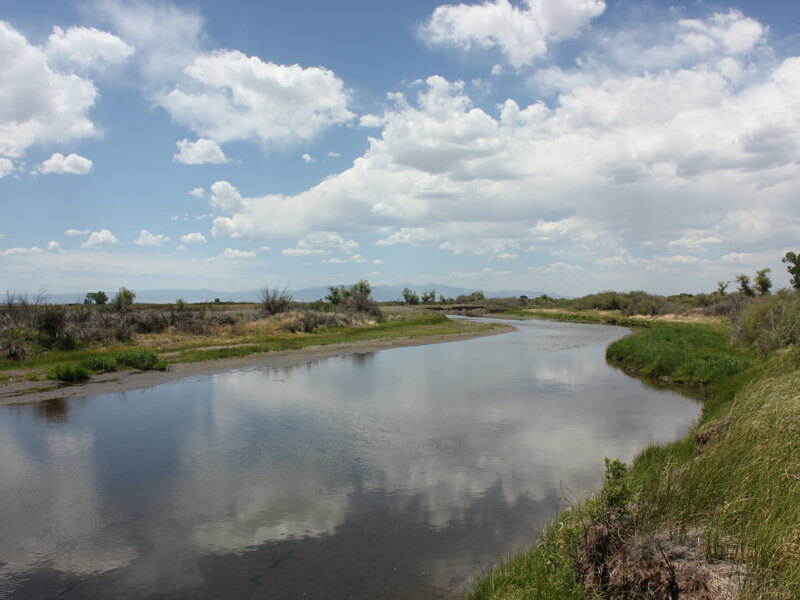 The Rio Grande flows from the San Juan Mountains, then turns to head south in Alamosa. The South Fork officially begins at Wolf Creek Pass, famous for its powder skiing. From here, the river parallels Highway 160, so public access is relatively easy; there are also several US Forest Service campgrounds along the river for this stretch, and much of the Rio Grande is wadeable here. The river gets bigger between South Fork and Del Norte, and thanks to lack of public access between the two towns, float fishing is a popular choice, though the fishing easement partway between the two towns is occasionally wadeable. If you don’t have an oar-boat (or a friend you can bribe), consider hiring a local guide, who can take you downriver and show you the best spots to fish, along with the perfect flies to use during the time of year you’re there. The section between South Fork and Del Norte is designated Gold Medal Water, and it’s not hard to see why. Big brown and rainbow trout can’t wait to latch onto flies ranging in size from midges to grasshoppers. Here, you’ll probably want to use a dropper and a dry fly, since the river is considerably deeper than it is upstream. Browns here tend to hold in deeper water near the banks and under willow roots, and are known for not being fussy. The size and type of flies you’ll want varies widely throughout the season, so contact a local shop when you hit town (Duranglers is a popular choice with a good reputation) to ask what folks are fishing. This section of the Rio Grande is truly incredible, both for its excellent fishing opportunities and for its breathtaking scenery. To really make the most of a trip, it’s best to have some knowledge of fly-fishing techniques and do some homework on the best flies to use for the time of year. There are certainly some spots to access the river in waders (much public access here is through State Wildlife Areas, or SWAs), but the best fishing is done by float, so it requires a bit more commitment. It’s typically too cold to fish before June, and after August, the river’s too low to float, so plan your visit accordingly. Because there’s not a ton of public access to the river between South Fork and Del Norte, choose your entrance carefully, either hiring a professional guide who has permission and knows the ropes or taking care to access only via US Forest Service or State Wildlife Area points. Several guide outfits offer trips down this stretch of the Rio Grande.